The player must always aim at the lowest numbered ball on the table, his turn continues whilst he pots balls (even if it's not the one aimed at) - the first player to pot the 9 ball wins. The winner is the first player to pocket the black 9 ball. To begin, place the white cue ball anywhere on the white line, then click on it with your cue. You can adjust the power and aim at the '1' ball to break. For a legal break, at least 4 balls must touch a rail, or a colored ball must be pocketed. After player 'A' has made a legal break, If no ball was pocketed, the next player (player B) may announce a pushout. In a pushout, player B may play ANY shot - there is no requirement for the cueball to hit any ball, any ball (except the white) may be pocketed and remains out of play excepting the 9 ball with is respotted, play now reverts to player A even if a ball was pocketed. Player A may decline to play if he doesn't like the lie of the balls, in this case player B shoots again. The player must always aim at lowest numbered ball left on the table. If a player pockets any ball, even if it is not the one he aimed at, he remains at the table (taking the next shot). The game is won by the first player who pockets the 9 ball. failing to drive at least one ball to a rail in each shot. If the 9 ball is pocketed while a foul is committed, it is replaced in its original position. Three consecutive fouls will forfeit the game. 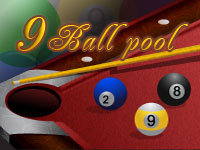 If the nine ball is pocketed while a foul is committed, it is replaced in its original position.